Other Services - Budget Refinishers, Inc. Does your bathroom or kitchen sink have chips, cracks or is just difficult to clean? Rust that is difficult to remove or maybe your sink is an outdated color? Budget Refinishers also reglazes sinks! This is a very cost effective option verses replacement for homeowners and commercial properties. Budget Refinishers doesn’t just do tubs! We can restore your old shower base to a like-new finish. Call us today for pricing! 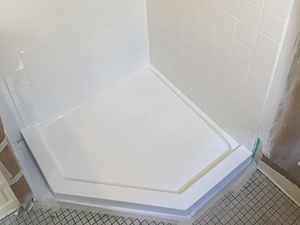 Don’t let your ugly old drain covers and overflows ruin the look of your newly refinished tub! Budget Refinishers can replace them with shiny new ones! Call us today and give your tub a whole new look.